Definition at line 1677 of file lscript_tree.h. Definition at line 1680 of file lscript_tree.h. Definition at line 1685 of file lscript_tree.h. 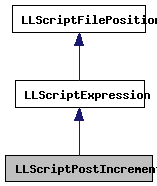 Definition at line 6923 of file lscript_tree.cpp. 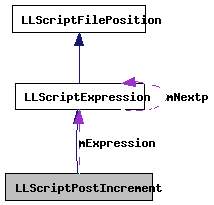 Definition at line 6796 of file lscript_tree.cpp. References LLScriptByteCodeChunk::addByte(), LLScriptByteCodeChunk::addFloat(), LLScriptByteCodeChunk::addInteger(), f, gErrorToText, LLScriptGenerateErrorText::getErrors(), LLScriptExpression::gonext(), legal_unary_expression(), LET_LVALUE, LOPC_ADD, LOPC_POP, LOPC_POPL, LOPC_POPQ, LOPC_POPS, LOPC_POPV, LOPC_PUSHARGF, LOPC_PUSHARGI, LSCP_EMIT_ASSEMBLY, LSCP_EMIT_CIL_ASSEMBLY, LSCP_PRETTY_PRINT, LSCP_TO_STACK, LSCP_TYPE, LSCRIPTOpCodes, LSCRIPTTypeByte, LSCRIPTTypeHi4Bits, LSCRIPTTypePop, LSERROR_EXPRESSION_ON_LVALUE, LSERROR_TYPE_MISMATCH, LST_FLOATINGPOINT, LST_INTEGER, LST_KEY, LST_LIST, LST_QUATERNION, LST_STRING, LST_VECTOR, mExpression, LLScriptExpression::mLeftType, LLScriptExpression::mReturnType, LLScriptExpression::mType, NULL, print_asignment(), print_cil_asignment(), print_cil_load_address(), LLScriptExpression::recurse(), store2stack(), and LLScriptGenerateErrorText::writeError(). Definition at line 1692 of file lscript_tree.h.